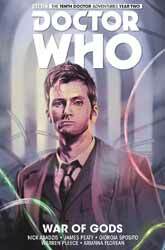 The epic conclusion of the Tenth Doctor’s second year of all-new adventures! On the impossible starship Shining Horizon, the ancient entity Sutekh has risen again – and this time, he’s brought some fearsome allies with him! Will the TARDIS team, along with Dorothy and Anubis, be able to stop them? Join the Doctor, Gabby and Cindy for more adventures and battles against ancient gods! Superstar writers Nick Abadzis (Laika) and James Peaty (Supergirl), along with brilliant artists Giorgia Sposito (Wonderland, Charmed) and Warren Pleece (The Great Unwashed), steer the TARDIS through this game-changing next chapter in the Doctor’s ongoing story…! Has Anubis fallen to the darkness in his family tree? Has his father Sutekh truly returned, or is there something more nefarious going on? And, more importantly, can the Doctor, Gabby and Cindy staunch the corruption in an entity powerful enough to snuff them out with a thought…? First we have the three-part finale to the Old Girl storyline, in which Sutekh the Destroyer finally returns. Of course, this had been on the cards for a while now, with the Osiran gradually manifesting himself within the mind of his son Anubis, but here at last he becomes a physical presence. In addition to the presence of Sutekh, Sposito and writer Nick Abadzis provoke further nostalgia with scenes of the Doctor and his friends being hunted down by mummy-shaped service robots, and a one-page flashback to Pyramids of Mars, featuring the likenesses of the Fourth Doctor, Sarah Jane Smith and the colourful space-time tunnel. The power of Sutekh’s hard stare is accurately conveyed via bright green light and the sound effect “VORSSH”. Since we were all expecting Sutekh’s return, Abadzis surprises us by adding a plethora of fellow god-like entities, who escape from the same limbo dimension as the Osiran. When Sutekh first refers to his “so-called allies”, I wondered who he might mean – the Dæmons, perhaps? Instead, we see several recognisable old foes, beings from beyond our space and time, including the King Nocturne, a God of Ragnarok and the Destroyer (here referred to by one of his other names, Eater of Worlds). This is not really a spoiler, as the double-page reveal is reproduced on the back cover of this graphic novel. And if you look carefully at the background of the image, is that the Beast? However, most of these creatures are restricted to bit parts and are used as cannon fodder by the ruthless Sutekh – though Abadzis’s own creation, the King Nocturne, has more to do than most. It may surprise you that Sutekh is shown to be more powerful than any of these creatures, even the Beast, but it is explained that this is because the Osiran is native to our universe, whereas his ‘allies’ are not. As with Pyramids of Mars, the writer realises that the threat of Sutekh’s release from captivity has more dramatic potential than the actuality of it, so by the time we reach that point, the story is almost over. The closing acts of this arc are certainly packed with incident, but perhaps the build-up went on for a bit too long. The Doctor and Gabby stop off in London’s ‘silicon roundabout’, a hotbed of tech development… only to find that an interdimensional creature is poking holes in the fabric of reality. In order to close the breaches, the Doctor must face down some surprising echoes from his past…! Following the climax of Old Girl, we fast forward to Revolving Doors, which is from #3.5. The reason for the time jump is because this is the first available single-part story that could be used to fill out this collection. In retrospect, it might have been more sensible to split the 17 issues of Year Two across four volumes with a 5/4/4/4 pattern rather than 5/5/4/3. Then it wouldn’t have been necessary to poach material from Year Three. On the plus side, though, the writing and art team for this chapter make a refreshing change from the norm. It takes a moment to get used to seeing the Tenth Doctor and Gabby realised by Warren Pleece (whose work is more associated with Titan’s Eleventh Doctor series), but his deceptively simple style (similar to that of the late, great Steve Dillon) is easy to follow visually. James Peaty’s script is similarly ‘back to basics’, with the Doctor alternating between motormouth and moody modes. He doesn’t like being back in London because of the bad personal experiences he’s had there in the past – like being parted from companions. I can easily imagine David Tennant delivering lines such as, “Simple excitation of the residual dimensional bleed means we can get a look at Squiddy here” – more so, in fact, that I can with much of the dialogue that Nick Abadzis puts in his mouth. The plot is very much standalone, except for the fact that Cindy is mysteriously absent, having taken a break from the TARDIS for reasons that are not disclosed here. Octopoid foes like the Reach have been done a few times by Titan Comics in recent years, but this episode offers more welcome blasts from the past – which I won’t spoil for you. Following this one-shot filler, I hope that Peaty will return to write for the Doctor on a more regular basis.